No species has the right to consciously determine what proportion of all other species on earth should become extinct  as the compromise 2 and 3-degree temperature rise targets do. Lacking the collective will to act in a sustainable manner is no excuse. Serious climate-change impacts are already happening, both more rapidly and at lower global temperature increases than projected. As the USA's most eminent climate scientist, James Hansen, told 15,000 of his colleagues at a conference in December 2007, significant "climate tipping" points have already been passed (note 1 below). These include large ice sheet disintegration, significant sea level rises of up to 5 metres this century and devastating species loss. The Arctic will soon be free of summer sea-ice and the Greenland ice sheet is in imminent danger. Temperature increases of 2 degrees are effectively already in the system, unless we act dramatically to cut emissions towards zero as quickly as humanly possible. Humanity will no longer have the power to reverse the processes we have set in motion if we pass the "point of no return". The IPCC reports are dangerously conservative. A temperature cap of 22.4°C, as proposed within the United Nations framework, would take the planet’s climate beyond the temperature range of the last million years and into catastrophe. The tipping points for large ice sheet and species loss were crossed when we exceeded 300-350 ppm of carbon dioxide in the atmosphere, a point passed decades ago. It is no longer a case of how much more we can "safely" emit, but whether we can quickly enough stop emissions and produce a cooling before we hit tipping points and positive feedbacks  such as carbon sink failure and permafrost loss  that will take the trajectory of the earth’s climate system beyond any hope of human restoration. Hansen notes that we either begin to roll back not only the carbon emissions but also the absolute amount in the atmosphere, or else we're going to get big impacts (note 1). We face a multi-factor sustainability crisis and systemic breakdown. The obstacles to implementing climate solutions are political and social in character, not technological or economic. Speed is of the essence in constructing a post-carbon economy as quickly as humanly possible. An imaginative, large-scale programme comparable in scope to the "war economy" or the transformation of the Asian "tiger" economies is required. These imperatives are incompatible with the “realities” of “politics as usual” and “business as usual”. Our conventional mode of politics is short-term, adversarial and incremental, fearful of deep, quick change and simply incapable of managing the transition at the necessary speed. The climate crisis will not respond to incremental modification of the business-as-usual model. Climate policy is characterised by the habituation of low expectations and a culture of failure. There is an urgent need to reconceive the issue we face as a sustainability emergency, that takes us beyond the politics of failure-inducing compromise. Even moderate goals (25-40% below 1990 by 2020) now require immoderate rates of change only achievable by shifting to an emergency footing. 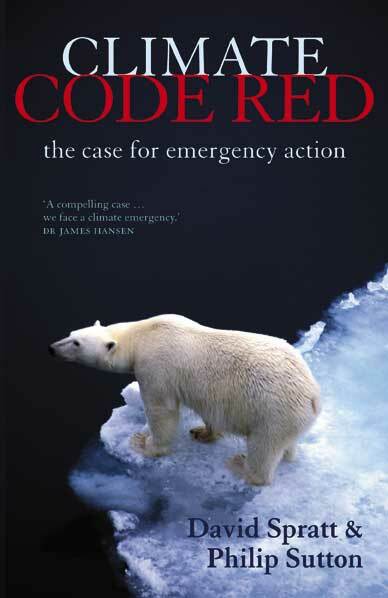 Sample Climate Code Red with free PDF of the foreword, introduction, and sample chapter.